Compared with elective endotracheal intubation for surgery, emergency endotracheal intubation for critically ill patients is more difficult because of the poor cardiorespiratory reserve of patients, stress and urgency of intubation, and environmental limitations outside of the operation theatre setting. Therefore, emergency intubation has higher complication rates and lower first-attempt success [1, 2]. Methods used to facilitate intubation include videolaryngoscopes and bougies [2, 3], and bougie use improves first-attempt intubation success compared with stylet use . Although videolaryngoscopy often improves vocal cord visualization, intubation success does not seem to improve when adding videolaryngoscopy to bougie use. Better visualization does not ensure easier intubation, as insertion of the bougie into the trachea would still require optimal neck positioning and a straight oral-pharyngeal-laryngeal axis . 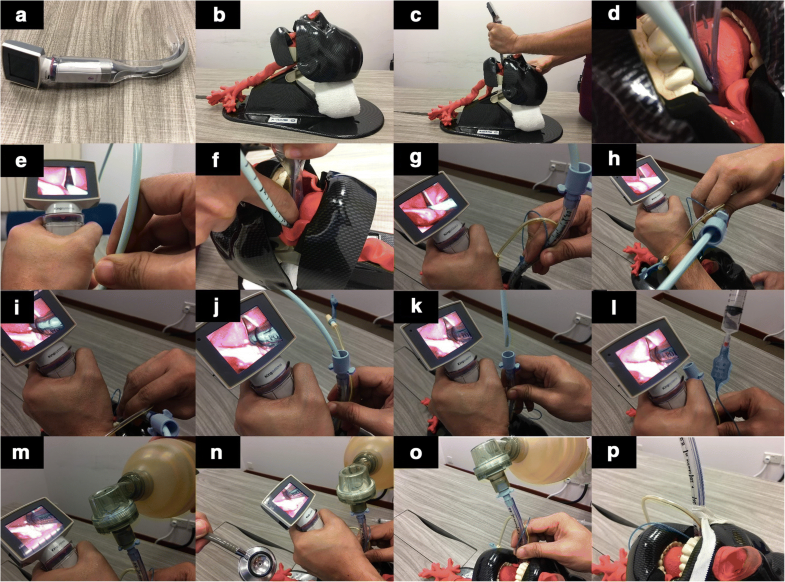 Channeled blades attached to hyperangulated videolaryngoscopes can overcome the limitation of neck positioning as the channel can guide a bougie toward the glottic opening. The bougie then can be shifted laterally out of the channel, allowing a large (size 7 or greater) endotracheal tube to be railroaded and rotated easily. Since June 2018, we started to use the channeled blade of the King Vision videolaryngoscope (Ambu A/S, Ballerup, Denmark) in the following 16-step fashion (Fig. 1). Twenty-five respiratory therapists were introduced to the bougie-in-channel technique via a 15-min tutorial and demonstration. Of these therapists, who have never performed endotracheal intubation before, 24 successfully intubated a manikin within 2 min each and one therapist intubated at a second attempt. This technique has been rolled out in our medical intensive care unit with first-attempt success among the first 10 patients, and a formal audit is in progress. The authors would like to thank Alfredo Pineda for assisting with taking photos. KCS and JT conceived the study, participated in its design and coordination, and drafted the manuscript. KCS, ME, RC, SHW, JS, and JT jointly conducted training and implemented the bougie-in-channel intubation technique in our intensive care unit. All authors read and approved the final manuscript.